‘Reflecting on Irish Pilgrimage‘ is a public seminar I am holding to mark the close of my exhibition in the UCC Library ‘Journeys of Belief and Belonging: Modern Irish Pilgrimage’. 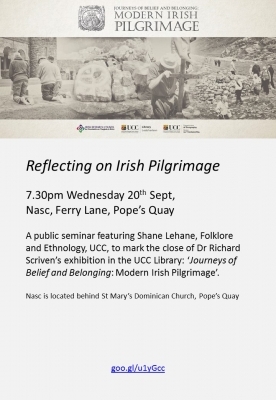 It will include contributions from Shane Lehane, Folklore and Ethnology, UCC, and myself, followed by a general discussion exploring the pilgrimage tradition in Ireland. This event hopes to consider the ongoing role of pilgrimage in the lives of individuals and communities. It is on at 7.30pm Wednesday 20th Sept, in Nasc, Ferry Lane, off Pope’s Quay (behind St Mary’s Dominican Church). I have an exhibition in the UCC Library running from early April until late June. It explores the pilgrimage tradition and how it is manifest in contemporary Ireland. Using images and text, it illustrates how pilgrimage, an activity usually associated with the past, is a vibrant cultural phenomenon that inspires millions of people annually to leave home, go on a journey, and try to connect with the more meaningful aspects of life. 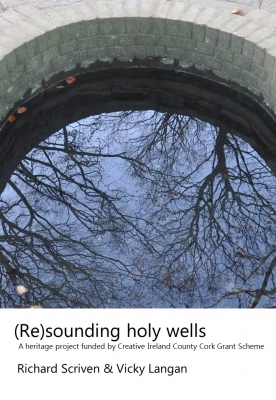 The exhibition uses images taken during my fieldwork at some of Ireland’s main pilgrimage sites, Lough Derg, Co Dongeal; Croagh Patrick, Co. Mayo; Knock, Co. Mayo; and, a holy wells in Munster. These photographs of pilgrims and rituals offer a window into this living and evolving tradition. Quotations from people interviewed during the research add personal stories revealing how pilgrimage is a rich spiritual and emotional journey for many. The aim of the exhibition is to highlight the significant role pilgrimage still plays in the emotional and spiritual lives of thousands of individuals and in the social life of communities. As a piece of geographical research, it focuses on the relationships between people and place. It considers how through performing pilgrimage, people are ‘making’ holy places and how the locations are, simultaneously, defining people as pilgrims. 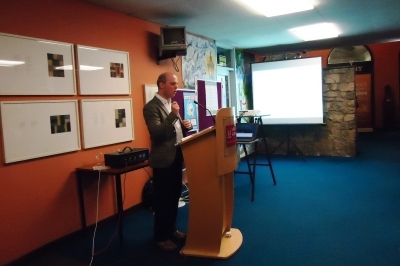 The exhibition is funded by the Irish Research Council and UCC Library. 2. We have a role and even a duty to participate. We all have knowledges, skills and access that are not available to the others and these can be used to benefit discussions, debates and understandings. This is especially true for those in university settings. My own interest saw me gravitating towards areas such as Social and Cultural Geography or Research Methods where I found articles I could contribute to. Anyone with an area of expertise can contribute to these sections. The content is decided by those who write it, but in the case of Wikipedia that editor/author can, and should be, you. 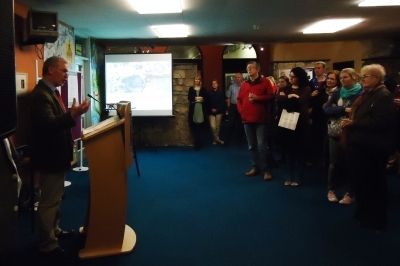 A confluence of events led me to reflect on academic and research geographers engaging with the wider public, both in creating conversations with and about our work, but also raising awareness about geography and what it is. The first of these was recent discussions both on Twitter and at a Social and Cultural Geography Reading Weekend in Wales about public geographies. In these, ideas such has who we are researching for and how we research were touched upon, especially in terms of the Impact agenda in the UK. One of the outcomes of the Twitter conversation was a blog post from Simon Cook’s new blog Jographies on utilising social media in this arena. I also had a number of public events during which I presented aspects of my own research to different people. 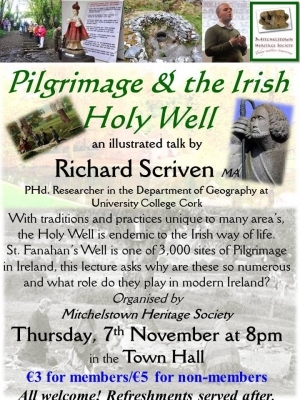 I gave a talk at Mitchelstown Heritage Society about Pilgrimage and the Irish Holy Wells, while also referencing the local holy well, St Fanahan’s. The Society is a very active group that does a significant amount of work in both educational and conservation terms in that area. It was a nice evening followed by interesting discussions and speculation on the continuing role of these sites. I also visited Bishopstown Community School to discuss Geography as a subject to study in University and outline how my research is geographical. I had a class with the senior geography deaf students, who had plenty of questions to ask. Finally, this week (18th-22nd Nov) is Geography Awareness Week. Tying in with National Geography Week in the US, the Geographical Society of Ireland is running several events and projects to raise awareness about geography and its role. As part of this year’s theme, An Exploration of Water, I am coordinating an online project where we are asking people to take a photo of water in their everyday lives and share it with us. More information can be found at gawireland.wordpress.com. My two main motivations for engaging in and developing public geographies – which to my mind includes this blog – is my belief in geography and my public funding. As a geographer, I firmly believe in the insight and worth of the discipline, especially as a tool for exploring the world and ourselves. I wish other people to know about this and to engage with it. Public geographies are one such way that this an be achieved. Also, I feel I have an obligation to disseminate and share my work because of the public funding I receive, previously through the Department of Geography UCC and now through the Irish Research Council. I intend to ensure that in whatever form my geographical career will take, it will remain sufficiently public.